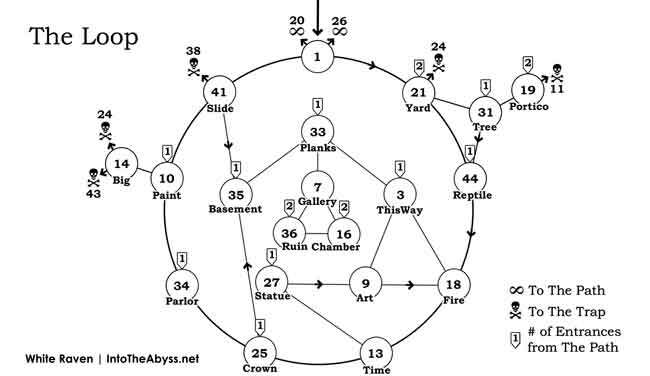 The House is generally arranged in three levels: upper (the Path), middle (the Loop), and lower (the Trap). The Path: The upper level contains nineteen rooms, the rooms of the 16 room path (one is visited twice) and four side rooms off of the Path. The only way to enter the Path is from room 1. Most doors on the Path exit to the Loop or the Trap. Navigate by clicking on numbers. The Loop: The middle (ground) level contains nineteen rooms that meander about eventually leading back to room 1. The loop can be entered from two of the four doors in room 1, or from many doors along the Path. There are only six ways to exit the loop: five lead to the Trap and one leads back to room 1. The Trap: The lower level contains seven trap rooms. The trap rooms can be entered from many doors along the Path or five doors from the Loop. There are no exits from the Trap and room 24 (the trap within the Trap) has no exit doors and ends the journey. - Images Copyright 1985 by Christopher Manson. Although I did not hear back from you yet, I decided to make it anyway just for fun. Would you like to put it up on this site? Yes, by all means! I’m looking forward to seeing it! I found the link in my spam folder. I am WiFi-less right now, but I will download in it a few days. In the meantime could you answer a few questions? > What language/engine did you create it in? > Do you have it online somewhere so we can see how it works? 2) Yes. As previously stated, each room has one .html file. What I do not currently have, however, is a way for you to type in the room number and be redirected to that file. 3) No, but I might be able to. I misunderstood, I assumed by “calculator” you meant a program probably written in java, which did calculations of some kind. I believe that the maps I have added to each page make the need for a list of room choices redundant. The maps have the most efficient path marked. Since you are a real MAZE fan and obviously put a lot of work into this project I would suggest starting your own blog. It is easy and usually free. Then you can just type in your lists and anything else you would like to share about MAZE. Yeah, that’s originally what I was going to do, but as you pointed out, that wasn’t really going to work, and I decided to hard-code it all. What do you recommend for creating my blog? I have a Maze blog that has barely been used. Send me an email if you want it. I made a Maze tool for a similar purpose yesterday. I can’t post the URL here, but if you look at my latest post on MazeCast (“Announcing Maze Birdfinder”) you’ll see it. It’s not doing the same thing as your idea, but I hope this helps anyway. I’d take Vewatkin up on his offer. But if you want to go your own way WordPress provides free blogs and you can embed html in the posts via a zip file. If you decide to make your own site just be sure you do not post images from the book (I have a contract with Manson for this site). If you are determined to post images I suggest using the ones which can be found on the archive-obs site which has permission from the publisher. I cannot guarantee Manson will not have a problem with the archive-obs images being reposted but these images are rather small and I am pretty sure he would be fine with it. But again, I’d take Vewatkin’s offer. It’s free and you would be part of a community of MAZE fans. The reason I didn’t use Vewatkin’s offer is that he said it has “barely been used” but either of you are welcome to provide a link to my site. It was my grandmother’s blog and she only used it once a week for church. Hmm… I might be interested. Was the blog used on roads that were salted in winter? George Washington slept on it. Enthusiasts may have a pretty good idea of how many birds there are, and where they can be located, but casual MAZE fans and the hundreds of thousands of English-speakers who don’t own a copy can still learn a lot from the Birdfinder. I have the same reaction whenever I read about the sport of bird watching. Interesting… that is something you should post on the blog. It may drive up the resale value. Yeah I mean, I’m pretty sure there’s others, but #21 is the only one I could name off the top of my head. This book seems like it should be easy to figure out. There are only 45 rooms. Not counting the inaccessible end of one-way doors, there are only about 136 doors. If you count the two ends of a two-way doorway as one door, there are only about 93 doors. Sure, the odds against making the correct choice in a series of rooms grow exponentially the more rooms you have to go through, but if you go through multiple times, you can learn through trial and error, right? It only takes 7 steps to get to Room 45, and there are only a few options at each step. It’s also not that hard to realize that all of the Trap rooms are bad, and even if you don’t memorize their numbers, you can cheat a little and go back a step whenever you go through a door and recognize a Trap room. However, that’s where the things that are easy to figure out end. I’m pretty sure I went through this book a lot more than 136 times as a kid, and while I did figure out that the Trap was bad and that a lot of rooms seemed to just lead me back to Room 1, I never once made it to Room 45. Even after I started cheating by flipping through to look at rooms I hadn’t technically gotten to yet, and checking to see which rooms led to Room 45, and whether there were any rooms that lead to those rooms, I STILL couldn’t figure it out. Truly, both the structure of the Maze and the nature of the puzzles and the other thing(s) you have to figure out makes it very challenging. In my opinion the two most amazing things about MAZE are 1. that Manson had the idea at all of a book through which one could wander and 2. the brilliant structural arrangement of the rooms. Each realm has it’s own purpose and is arranged to maximize clueless wandering. It is absolutely amazing when you consider that MAZE was the first of it’s kind. It is nice to see someone appreciate the deep structure of the path-system. I was planning to hard-code what to say for each room since there are only 45. Would that work? I’ll take that as a “no” then. What would you think of the idea I posted above? Sorry for the delay, I was responding to the hint for this month. It is a great idea! My time is limited but I will see if I can find a quick and easy way to implement it. I looked into it and as cool as a MAZE-calculator would be I simply do not have time to create such a thing. Have any easier to implement ideas? Just for (an additional) reference, rooms are as follows. 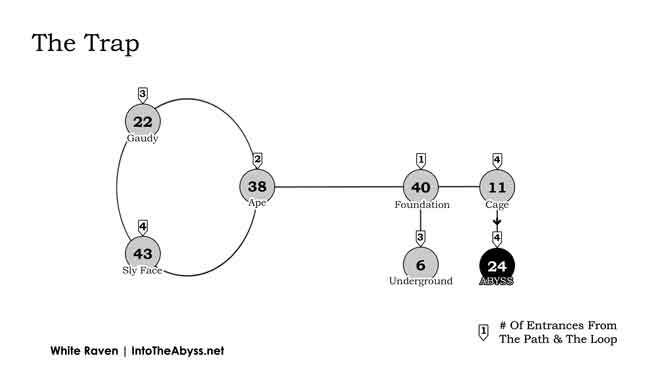 Welcome to Into The Abyss! 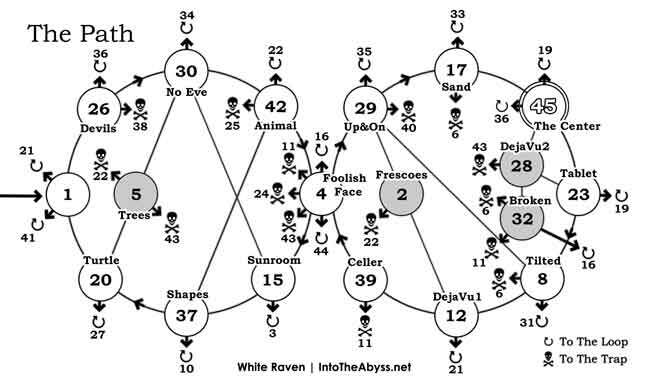 Hey White Raven, I was thinking of something where you input a room number and it tells you if you are in the path, loop, or trap, and even where to go from there. Raven – It’s hard to find the pages for the path, loop, trap rooms. I almost missed it. Never mind, I didn’t see the sidebar links.